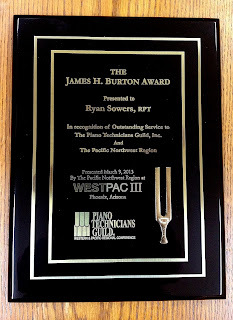 Pianova Piano Service & Sales: Ryan receives the James Burton Award from the Pacific Northwest Region of the Piano Technicians Guild! 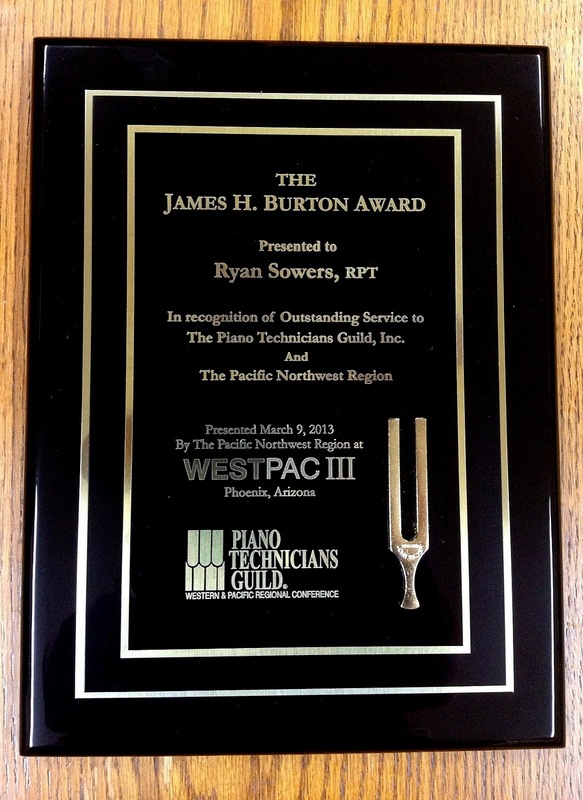 Ryan receives the James Burton Award from the Pacific Northwest Region of the Piano Technicians Guild! I was really surprised to find that I had been awarded the James H. Burton award for 2013. It gave me a burst of inspiration and enthusiasm toward my profession and towards the Piano Technicians Guild. I was surprised last year when my "20 year pin" from the guild arrived in the mail. Has it really been that long? I look forward to the next 20! "Each year the Pacific Northwest Regional Conference of the Piano Technicians Guild honors a member of PTG by bestowing the James H. Burton Award. The award is given to honor Jim, for the service he so willingly gave to PTG over many years, and the recipient who likewise, has given of themselves unselfishly to further piano technology in both the local, regional and national level."